On a hot Sunday morning in July 1998, my brother and I sat on the back seat of father’s aqua blue scooter to head off to the sabzi mandi for our weekly foraging for vegetables. It was scorching heat in my hometown in Jharkhand and which inevitably made me wear my half shorts and a funky t-shirt—a habit I have not yet outgrown. Sunday was a day dedicated for household shopping, and for my brother and I, it meant a day to eat dishes like chole bhature, dosa sambaar, pani puri and many other street foods while my father took care of the chores. I remember going many times and sitting (well-behaved and quiet) with my brother in front of a small shop “Best Dosa Place”. In retrospect, this was in fact, a great strategy to market it. Claiming to be the best in town definitely triggers people’s curiosity and it worked on us. Iyer Uncle, who must be in late his 40s, was the owner and he’d greet us with such a big and warm smile on his face. He’d feed us a little greasy and oily dosa with thin sambaar. To a large extent, he made me believe that South Indian food meant dosa, idli, utthapam with sambaar or coconut chutney. North Indians probably still have the same notion in their head, and we can probably all blame it on all Iyer Uncles. Time passed and I grew up, not just in age but in experience and wisdom as well. One thing that I learned was that it isn’t sambar but sambaar (with an extra A). You have got to pronounce it correctly. This new learning was one of many others. For starters, there was the marvellous discovery that South Indian food goes way beyond Idli-Dosa-Sambaar and that each state in the South has a very different and unique cuisine and flavour. Even among those that share sambaar as part of their food, the vegetables they use and the flavour of their sambaar is vastly different. Sambaar is essentially a tangy spicy lentil-based soup or gravy with vegetables like drumsticks, ladyfinger (okra) and carrot. It could be thick soup following the Keralite style, but Andhra Pradesh and Karnataka make their version with a little more water and jaggery to make it a sweet thin soup. Even idli is different. The idli can range from super soft and fluffy, to a tighter more rigid and dry form. We started talking different kinds of dosa that is available for foodies like us to dig in. Masala Dosa, Paper Dosa, Onion Dosa, Rawa Dosa and the list goes on. She said her family enjoys dosa with coconut chutney but in the market, one can have it with sambaar, and tomato and coconut chutnies. Dosa is not necessarily just a breakfast food but can be munched on whenever one desires. After I was done eating food, and listening to her stories, I picked up my bag to leave for the airport and catch my Indigo flight to come back to Delhi. My flight was in the late evening, which gave me enough time to do my research about Dosa and Sambaar. Is it a version of pancakes? No, because pancakes are supposed to be fluffy and traditionally contain eggs and all-purpose flour, along with milk. So, is dosa like a crepe? No, because crepes are soft and light, savoury or sweet and they are a thinner version of pancakes with similar ingredients. Although dosa can qualify as a dish from the same family because of the technique that is used. Dosa is prepared with a fermented batter of soaked and uncooked black gram and rice in a ratio of 1:3. Fermentation gives the batter a slight sourness, but most importantly, it breaks down the starches so that they are more readily metabolised by the body. Dosa can be eaten just by itself or stuffed with mashed potato cooked in Indian spices. T K Acharya in his book, The Story of Our Food, has talked about the origin of dosa where he mentions that earliest origin can be traced back to 1500 years ago in Tamil Nadu. At the time, it was also called as tocai (tho-sai). 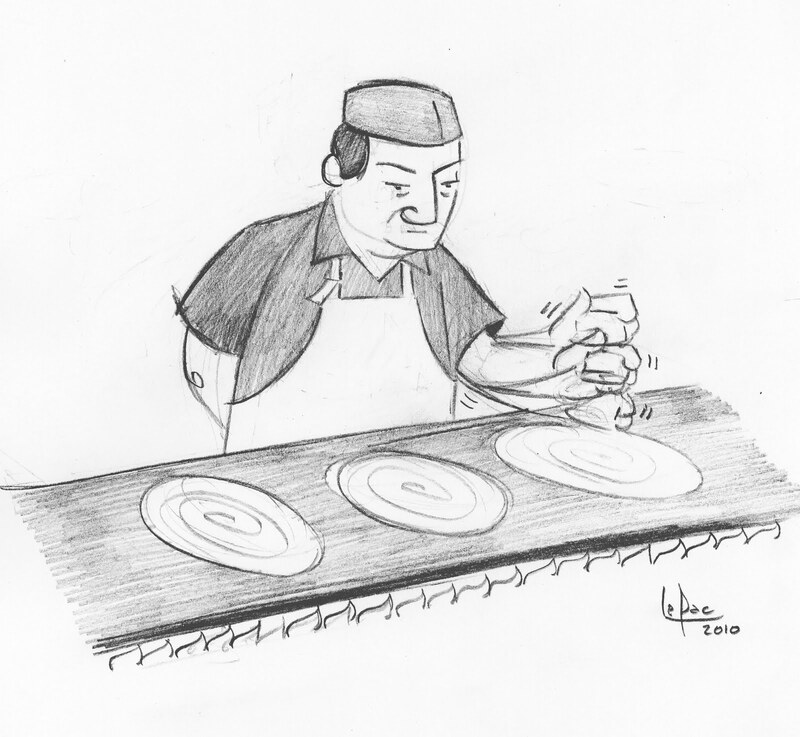 As per Sangam literature, dosa has been in ancient Tamil cuisine since the 1st Century AD whereas historian P Thankappan Nair says dosa originated in the Udupi town of present-day Karnataka. 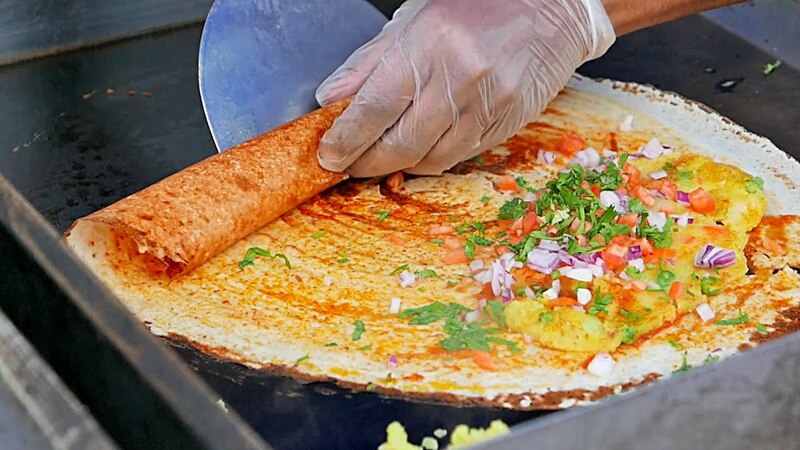 The original Tamil dosa was softer and thicker whereas the popular, thinner and crisper version of dosa was first made in present-day Karnataka. A recipe for dosa known as Dosaka can be found in Manasollasa, a 12th century Sanskrit encyclopedia compiled by Someshvara III, who ruled from present day Karnataka. It is also believed that uttapam (or uthapam) existed before the dosa — around 1st century AD — and is basically the same thing, except thicker, fluffier and usually topped with spices, onions, curry leaves and chillies. Could this be the original Tamilian Dosa? I can’t confirm. But whatever the case may be, we should thank the creators who decided to throw the fermented batter on a pan to roast it crisp. When it comes to dosa batter, I am not sure if there is something like “over-fermentation” because the same batter can be used to make idli, kal dosa, and many other dishes. This thin lentil and vegetable stew is not that ancient, but I always wonder how sambaar became the staple of all south Indian dishes. Be it dosa, idli, rice or South Indian thali, you will find this dish standing tall and has high value in the way you serve it, the masalas and the vegetables you use. Sambaar often contains a coarse mix of roasted lentils, dried whole red chilies, fenugreek seeds, coriander seeds and sometimes asafoetida and curry leaves. Regional variations include cumin, black pepper, grated coconut, cinnamon, or other spices. This mix is called sambaar powder or Champaar which according to one story comes from old Tamil world Champaaram meaning “spicy condiments”. The other story claims that Maharastrian Amti could be the inspiration behind Sambaar. The story goes back to the rule of Shahuji 1 (1684-1712). It is believed that he was hosting Sambhaji, the Second Emperor of the Maratha Empire. On the day, his royal cooks were supposed to be cooking amti but the kitchen was missing major ingredients like tur dal and kokum and hence the chefs had no option but to tweak and add moong dal and tamarind pulp. It is also believed that this dish was later named after the royal visitor- Sambhaji. Whatever the true origin story may be but the fact of the matter remains that Sambaar is amazing tastes good just by itself or with other condiments. It is versatile, simple to cook and has only a few spices to give you a unique gastronomical experience.